In a small bowl, beat cream cheese and whipped topping until smooth. Chill until serving. In a large bowl, combine the flour, cracker crumb, sugar, baking powder, baking soda and salt. Combine eggs, buttermilk and butter; add to dry ingredients just until moistened. Fold in blueberries. Pour 1/4 c. batter onto greased hot griddle. Spread topping over finished pancakes. 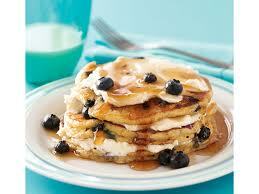 Top with warm syrup and sprinkle with additional blueberries, if desired.